Soft all-over shader for mineral eyeshadows. Brush length is approximately 6 1/2 inches with a 1/2 inch wide brush head. Not all synthetic brushes are created equally. 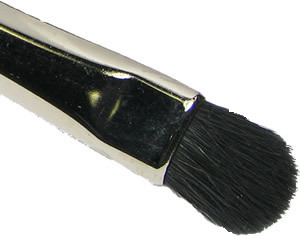 Each black faux brush is specifically selected for use with mineral make up. They pick up color well and deliver a soft and smooth application. Synthetic bristles are hypoallergenic and safe for sensitive skin. They clean and dry quickly, are extremely durable and do not shed. individually pouched, 100% synthetic hair brushes.